After months of romance rumors, “Dancing with the Stars” dancer Val Chmerkovskiy and Amber Rose are kissing on social media! On Wednesday, Amber posted a photo of herself in a lip lock with Val with the caption, “My Love." Val added his own photo with him kissing her hand and captioned the photo with a red rose. "You date people to get to know them and you either like them after six months or you don't, and you just figure it out along the way. Right now it's absolutely amazing and I'm super, super happy,” Rose went on. 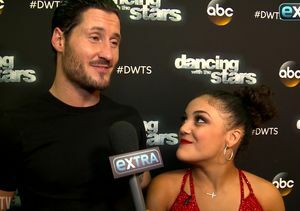 Later in the day, Val defended his relationship with Amber on Twitter, saying in now-deleted tweets, "not surprising but still fairly disappointing how ignorant and vile people are. The hypocrisy. All these bible proverbs and absolutely zero follow thru [sic]. All this ‘love’ yet zero empathy. I’m speechless. TBH. Not because I have nothing to say. Just don’t have anything to say y’all capable of understand [sic. ]” See his other tweets below! Last month, Val and Amber were caught holding hands after a night at celeb hotspot Delilah in West Hollywood. 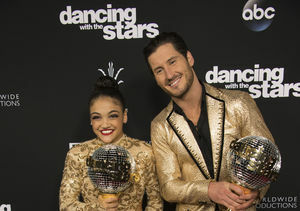 The pair met on the 23rd season of “Dancing with the Stars,” when she was paired with Val’s older brother Maksim. In November, Val commented on the dating rumors while hanging out with “Extra’s” AJ Calloway at our H&M studios in Times Square. Watch! The pair sparked rumors in October after they celebrated her 33rd birthday together.